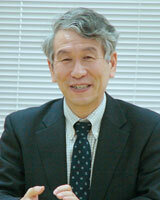 KEK Director General, Dr. Atsuto Suzuki, was awarded the Bruno Pontecorvo Prize by the JINR and Dzhelepov Laboratory of Nuclear Problems on January 19, 2007. The award is a recognition of his contribution to the "Discovery of Reactor Antineutrino Oscillations and Detection of Geoantineutrinos in the KamLAND experiment"
Dr. Suzuki, by then an associate professor at Tohoku University, directed the KamLAND experiment from the beginning of its construction in Kamioka. While he was working for Tohoku University, KamLAND was constructed to detect reactor antineutrino from a reactor 180 km away. The experiment also observed geoneutrino for the first time. The prize is awarded annually to the scientists who have achieved outstanding result in the field of particle physics.